Speed converter handles meters per second, kilometers per hour, miles per hour, feet per second and knots. 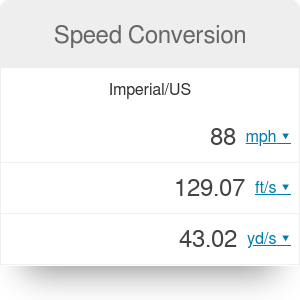 Speed conversion calculator enables you to convert between 10 different speed measurement units in real time. Choose between popular units such as kilometers per hour, meters per second, feet per second, miles per hour and knots, or pick the ones used e.g. in astronomy, as kilometers per second or speed of light. Enter the value you already know and you will see results in 4 other units instantly. While this cool simply converts from one unit to another, speed calculator works out velocity based on time and distance. Sports enthusiasts will find the running pace calculator useful. Feet per second and miles per hour are units used in countries where imperial system is in use, such as United States, United Kingdom or Australia. Meters per second and kilometers per hour are on the other hand in common use in any other country worldwide. Knots belong to none of these systems as they are used for measuring speed on the sea. One knot equals one nautical mile per hour (approximately 1.151 mph). Speed Conversion can be embedded on your website to enrich the content you wrote and make it easier for your visitors to understand your message.